Veterans receive rebates off their roof in St. Louis County. Receive a $250 rebate off your GAF Lifetime Roofing System* when installed by XteriorPRO, a GAF Factory-Certified Master Elite Contractor! 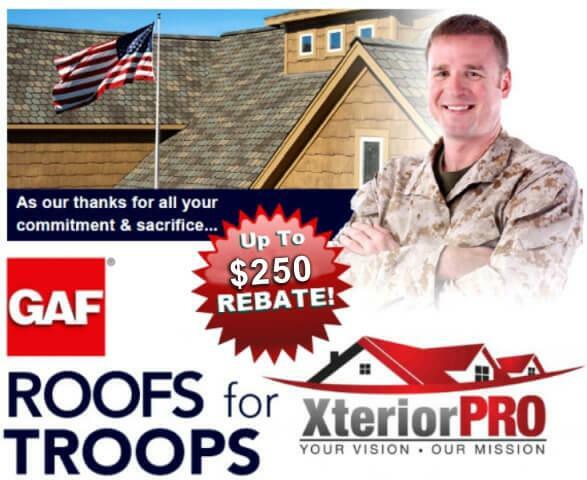 XteriorPRO will match the $250 GAF rebate dollar-for-dollar to help show our ongoing respect for the men & women who give so much to our nation. Thank you for your service, sacrifice, and commitment. For additional information, please contact XteriorPRO by Clicking Here or calling (636) 200-6600. *A GAF Lifetime Roofing System consists of GAF Lifetime Shingles and at least three qualifying GAF accessories. For more information see gaf.com/lifetimeroofingsystem. Also, see GAF Shingle & Accessory Ltd. Warranty for complete coverage and restrictions. The word “Lifetime” means as long as the original individual owner(s) of a single-family detached residence [or the second owner(s) in certain circumstances] owns the property where the shingles and accessories are installed. For owners/structures not meeting above criteria, Lifetime coverage is not applicable. Lifetime Ltd. Warranty on accessories requires the use of at least 3 qualifying GAF accessories and the use of Lifetime Shingles. Offer valid only for a GAF Lifetime Roofing System* installed on the home of an individual who is (a) in the active U.S. Military; (b) a veteran of the U.S. Military; or (c) a retiree of the U.S. Military. Valid in the U.S. Only. Must be installed between January 1, 2016, and December 31, 2017, by a GAF Master Elite® or GAF Certified™ Contractor. Submission for rebate must be received within 8 weeks of the installation date. Limit 1 rebate per GAF Lifetime Roofing System*.